An agenda template is something most managers should be using but usually aren’t. It’s all too easy to call for a board meeting with no real plan in mind, to start with an issue and see where it goes from there. This can end up being a colossal waste of time. Even if you feel productive by hosting all these meetings, unless some key issue is resolved and some practical, actionable plan is created, you are not really doing anything important. 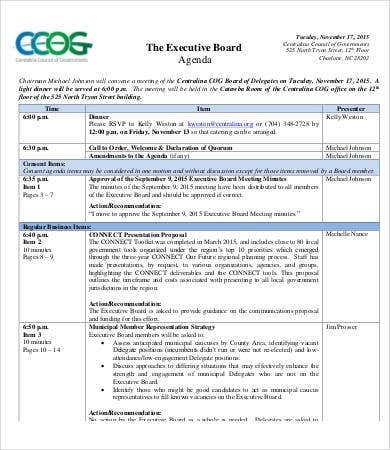 A board agenda will then help keep the meeting on track and centered around an end purpose. How do you go about preparing a meeting agenda? Take a page from these examples of board meeting agendas. You can download any of them as free PDF samples. With these, you can create an effective meeting agenda in no time. Why Do I Need an Agenda? The word agenda suggests purpose. 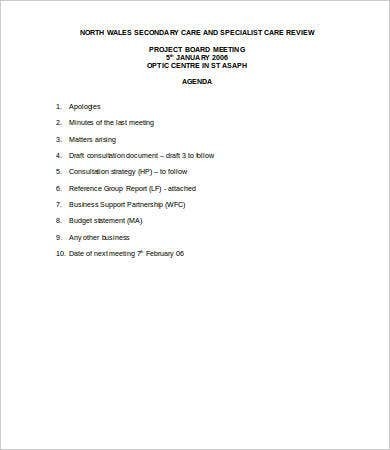 The written agenda is then a list of ideas or issues to address during the meeting. It also denotes the underlying program governing the meeting. A good agenda will run from A to Z within a reasonable time frame. A well-prepared agenda will likely have to be typed out by the secretary and copies distributed around the boardroom. This will act as a road map to give everyone present an idea of where this meeting is heading and if you start to go off-track. Agenda templates in Word could help you do just that. How Do I Start Creating an Agenda? Start with the reason you wanted to call a board meeting in the first place. 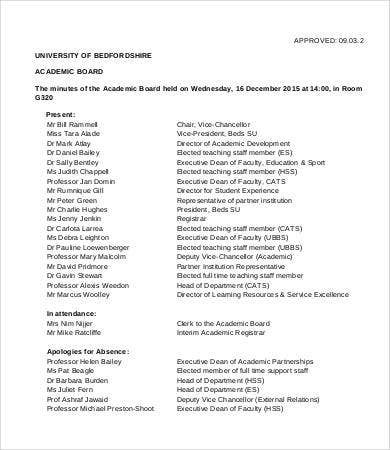 Why did you think you were justified in calling together these important business people, who would normally be very busy, unless you had some key issue to talk about? This issue or question will be your key note that you will be building the agenda around. So how do you start drafting such an agenda? First, put into writing your main objective. Next, study these samples for how they go about suggesting an outline to address their given objectives. Then it’s your turn. 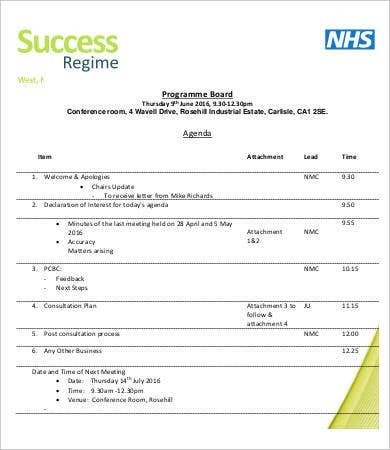 Start with a conference agenda template or a blank meeting agenda template, and build from there. 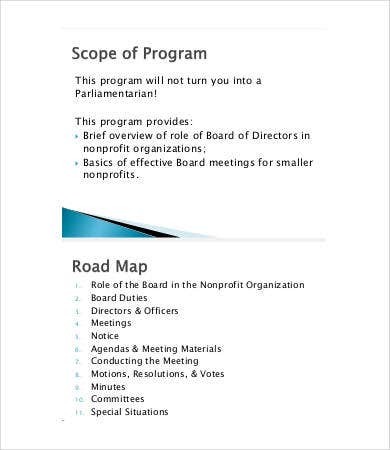 Nonprofit board agenda. 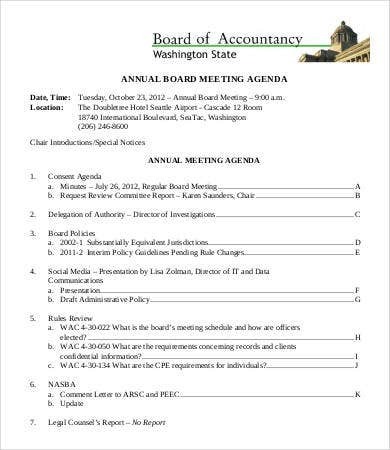 This will naturally differ from agendas primarily focused on in for-profit meetings. Project board meeting agenda. When discussing the progress and status of specific projects instead of overall company direction. 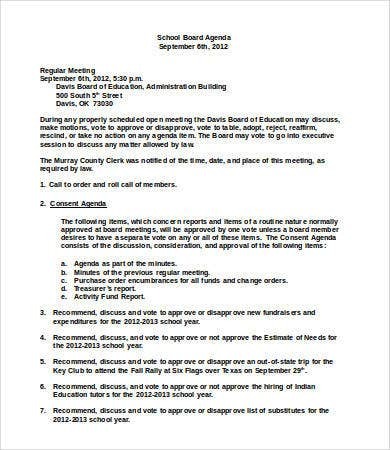 School board agenda and academic board agenda. For authorities responsible for providing and maintaining educational institutions. 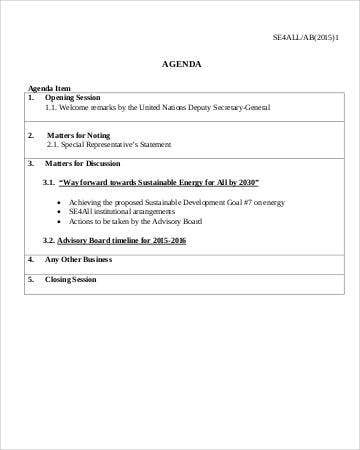 Advisory board agenda. The key issue here is to provide advice at certain key junctures in an organization’s lifetime. 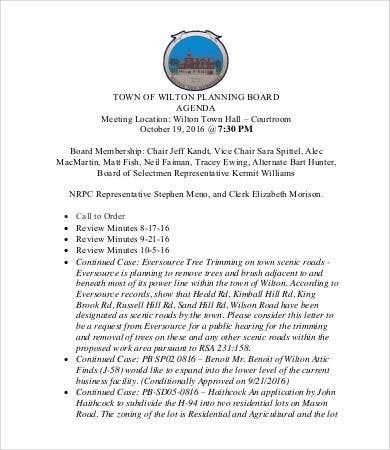 Planning board agenda and executive board agenda. Regarding the overall running of a business. 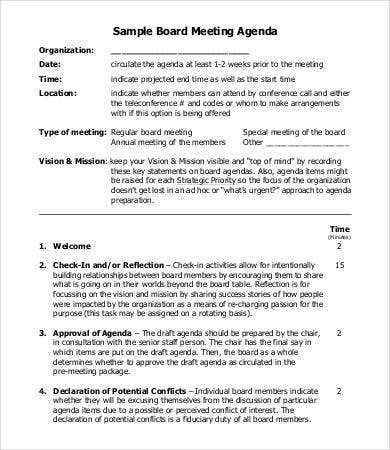 Download all of these board meeting agenda templates for free PDF files and use the information however you wish.